Though it was my family’s first time to the panto, largely because we’re Jewish, it wasn’t difficult to get Kid (nearly 5) on the right page to appreciate the wackiness, hijinks, and audience participation that the classic Christmas pantomime demands. “Just think of it like a Purimspiel,” I told him. “I can shout?” he asked. Well, yes. Also, I explained: things will be ridiculous, and there will be crossdressing and assorted hijinks, and lots of funny jokes. Evil will attempt to take over but good will win out, as it should be, and whenever the villain comes on stage you can boo and hiss as loud as you can. You can even wear a silly costume if you like, I told him (though I put my foot down at another turn as Darth Papa. That cloak is too warm). Ross Petty’s Cinderella at the Elgin…sort of delivered? With a lot of style – great costumes, exceptional projections, and vignettes charming enough to make us feel almost like we weren’t even watching commercials – Ross Petty and his band of merry persons got us maybe halfway there. Unfortunately, the Cinderella story, a classic that we read in advance so Kid could follow the panto version, got reversed and possibly also inverted? And folded, spindled, and mutilated. Cinderella fell for the prince all right, but the prince was…pretending not to be a prince? So when she fell for him, she didn’t think he was himself, and then he got hypnotized by her Evil Stepmother and Cinderella has to steal her Fairy Godmother’s wand, but then it…ran out of batteries? 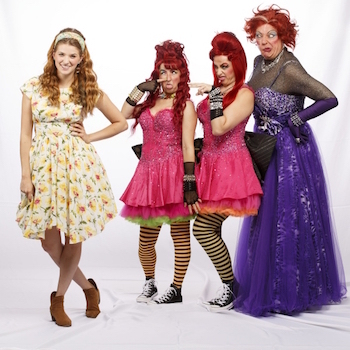 By which I mean, listen: I am plenty in favor of zaniness and madcap antics, but Cinderella has enough for two shows. At least. However, there are distinct upsides. We all enjoyed the songs and the nicely choreographed dance sequences, including the takes on modern songs. While the pace wasn’t what we might have hoped (2.5 hours with intermission is a little long for a children’s show, people) we did get a classic panto chase and Kid certainly got to enjoy shouting boos, cheers, and instructions at the stage along with the other rowdy audience members. It’s also a tremendously forgiving opportunity for children to be at the theatre – there are a ton of kids, and everyone understands perfectly well about being a little scared or fidgety. As an adult, I enjoyed the jokes pitched low enough to make the grown people groan and chortle (but just high enough to go over the heads of impressionable children). I really adored Eddie Glen as Buttons, sweet and game and slightly sharp tongued, and found the Evil Stepsisters (played by Cleopatra Williams and Bryn McAuley) quite satisfactorily Kardashian in their whiny ridiculousness. When asked about his favorite parts of the show, Kid reported that he loved the singing and was impressed by the real horses. “Anything else?” I prompted. Which really, sums the whole situation up quite nicely. Ross Petty’s Cinderella was great to look at. Tickets range in price from $85 to $27, with a family four pack available on some dates for $235. Tickets can be purchased in person at the Elgin box office, by phone at 1-855-599-9090, or online.